I have to admit, the main reason I wanted to make a Shnitzel is so I could say the word Shnitzel a few times. Shnitzel, Shnitzel, Shnitzel. Such a good word! The second is because having had this a few times pre Weight Watchers and enjoying it, I thought it was about time to make a healthier, less fried and oily version. This is a great meal if you are a fan of my Fakeaway KFC or Chicken Kiev. I’ve kept the pork steak whole but if you prefer you can cut into fingers and make several bites sized pieces. Either way it’s delish. 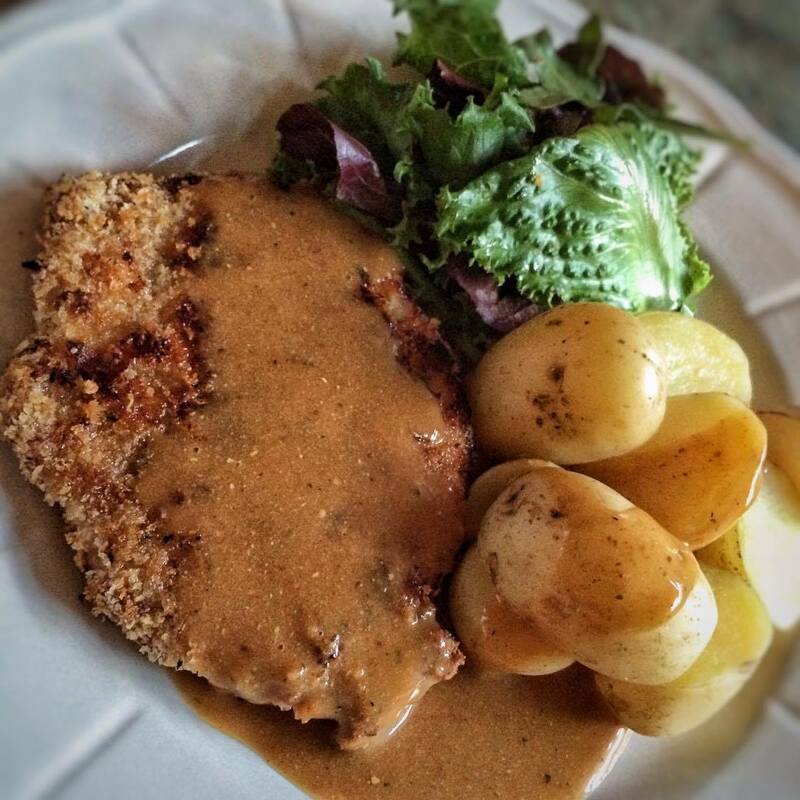 The first time I made this I served it with a mustardy potato salad but having learnt that Shnitzel is (apparently) served with mushroom sauce I thought I would incorporate this the second time. The sauce is lovely, quick and easy and can be served smooth (after being put through a sieve) or straight from the pan – nice and chunky. If you don’t fancy the sauce, a dollop of low fat sour cream with some garlic and lemon zest put through is a nice accompaniment for 1sp. For the mushroom sauce – serves 2 = 3sp per person (you get lots of sauce, this could be split between 3 people (for 2sp) or 4 (for 1sp) people. Heat the oven to 200c. Prepare a baking tray by spraying with 1kal. Pop the pork steaks on a chopping board and using a meat mallet (or a rolling pin) flatten to around 1/4 inch thick. Season the pork steaks with a little salt and pepper. Take three bowls and line next to each other on a bench. In one, crack the egg and beat until smooth. In another add and combine the flour and spices. In the third add and combine the breadcrumbs, Parmesan and lemon zest. Take the first pork steak and coat well in the flour, then the egg and then the breadcrumbs. Repeat with the second steak so both are well covered (pat the breadcrumbs on if they don’t stick too well). Pop both onto the baking tray, spray with 1kal again and put in the oven for 30-35 minutes until the breadcrumbs are golden and the pork is cooked through. While the pork is cooking, pop the potatoes on to cook for 20 minutes, then drain and set aside. To make the mushroom sauce take a saucepan, spray with 1kal and then add the onion. Fry for 4-5 minutes until softened (add a little water if the pan gets dry) and then add the garlic and mushrooms. Fry for another 2 minutes and then add the flour coating well. Fry for another minute and then add the wine. Let the wine simmer and reduce a little and then add the chicken stock, mustard, Gloucestershire sauce and paprika. Reduce the heat and simmer until the pork is done. Remove from the heat and stir through the soured cream. Season to taste. At this point you can sieve the sauce so that it is smooth. Alternatively you can leave it chunky and enjoy all the lovely mushrooms. Pop the salad and potatoes on the plate with the pork. Share the sauce between the two of you and serve with a wedge of lemon. Can I just check is the 10sp just for the Pork Schnitzel? PS it’s delicious by the way, had problems thickening the sauce though.